Lacrosse is much more than a sport. Maineiax uses lacrosse to build friendships, teach life long lessons, create gateways to college, and provide an experience you cannot find anywhere else. Our travel teams are for elite players looking for more than just pick-up leagues. We practice and train to build fundamentals and game knowledge to become the best players and teammates as possible. Develop and improve individual players to help them reach their fullest potential. Emphasize team play and camaraderie to become better all-around lacrosse team players. Play at some of the best regional tournaments. Superior organization with consistent and efficient communication. High level instruction (college & elite HS coaches) under a model that meets the needs of all ages and ability levels. We will offer travel teams for boys graduating in 2024-2028 (rising 4th-8th grades in the 2019-2020 school year). We do not plan on offering high school teams unless there is enough interest from players. Please email maineiaxclub@gmail.com if you are a high school player interested in a travel team. The number of teams is based on the number of players participating. For middle school teams, we typically group teams by grades and skill level. 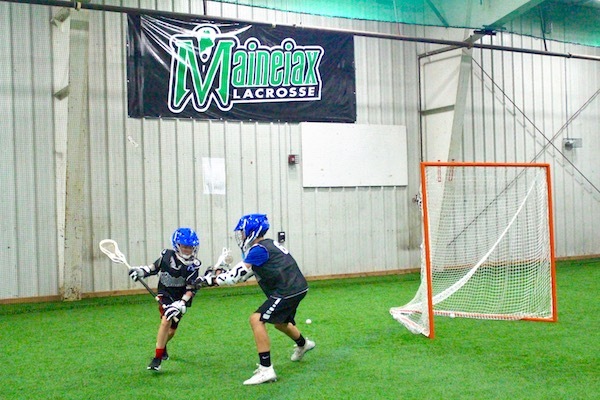 Maineiax reserves the right to alter grade levels for each team based on the players who make it. Players participate at 3 regional tournaments during the season. 2-hour practices that include individual and team feedback. Summer package includes 12 mid-week practices (includes camp practices) and fall package includes 8 Sunday practices. Winter travel practices TBD. Each player fills out a goals sheet during the season and coaches will provide each player with specific feedback at the end of the season. All players receive game jerseys and shorts. Summer Overnight Training Camp is recommended for all summer travel players. Players will spend two days together at Bates College working together, getting to know each other and having fun! More information can be found here. We are constantly evaluating if a player is getting challenged enough or is in over their head. If a player needs to be moved up or down, we will discuss with coaches and parents and move them to a more appropriate age group to ensure their development – even if it’s mid program. All players must attend a tryout. Those not qualified to participate in tournaments, will be asked to be a practice player or participate in another Maineiax program as we have a place for every player and offer a variety of programs. Each team has team parents who help organize tailgates and hotel blocks at tournaments, weeks and months in advance. Maineiax assumes that all travel players will participate in most practices and most tournaments. Players receive even playing time at tournaments, however, a player will get no game minutes if they have not attended any practices. We do not prorate costs for missed tournaments or practices. *We do not plan on offering high school teams unless there is enough interest from players. Please email maineiaxclub@gmail.com if you are a high school player interested in a travel team. All players must tryout and pay the one time $25 tryout fee at door. All players must be registered to try out. Players should attend one tryout date but are welcome to attend two or all three. Summer travel players have a spot on our fall roster but should try to attend one fall tryout. Each travel team has two coaches (mix of college & elite HS coaches) who offer high level instruction under a model that meets the needs of all ages and ability levels. Coaches are supportive to players & families while fostering teamwork and player development. Coaches are energetic, positive, engaged and present. At tournaments, coaches meet their team 1 hour before the first game to set goals and warmup. In between games, coaches meet with their teams to discuss goals met and areas for improvement. Coaches send pre tournament emails about goals and also send a short tournament recap about the team’s experience within 48 hours of the weekend. Cell phones are only used during practice to keep time for stations, to take video analysis of players or to take photos for the the website and social media. All teams will attend 3 regional and/or national tournaments during each season. Travel expenses (transportation, meals, hotels, etc.) are NOT included in travel fee and players are responsible for arranging them and getting to tournaments on their own. Tournament schedule is below but subject to change. Click HERE for a PDF version with websites included. Eight practices (in Portland) and three tournaments are all on Sundays in the fall between September 8th and November 17th. The cost of Maineiax travel covers the following: coaches salary, facility fees, tournament fees, training camp, travel gear, and administrative fees. We want all Maine players to have access to our travel teams so if you’d like to apply for a scholarship, please email maineiaxclub@gmail.com. A $250 deposit is due at registration and is refunded if the player doesn’t make the team. Full payment is due by June 15th for summer players and October 15 for fall players. We offer payment plans, sibling discount and scholarships. Email us at maineiaxclub@gmail.com to inquire. Deposits and partial payments can be paid here. Checks should be mailed to Maineiax Lacrosse Club, 36 Bruce Hill Rd, Cumberland, ME 04021. To check your balance and to pay in full click the registration button below. Maineiax travel teams are recommended for experienced players. We do not offer discounts for missed practices or tournaments. Summer Training Camp is recommended for summer players. Absences must be communicated beforehand so we can plan accordingly.